A dashcam video released Tuesday shows the moments leading up to and following the deadly police-involved shooting of 36-year-old Jerame Reid in Bridgeton, New Jersey. 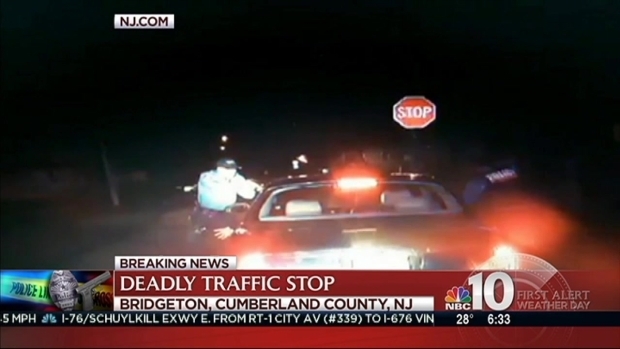 In the video, captured around 9:20 p.m. on Dec. 30, 2014, police officers in Bridgeton, New Jersey can be seen opening fire on Reid after they pulled over a Jaguar at South Avenue and Henry Street. Cumberland County Prosecutor Jennifer Webb-McRae said Bridgeton police officers Braheme Days and Roger Worley both shot one of two people who were in the stopped Jaguar. On Tuesday, the South Jersey Times obtained dashcam video which shows the shooting and the events leading up to it. In the profanity-laced encounter, police tell Reid to show them his hands and not move. "If you reach for something you're going to be dead," an officer can be heard saying. Officials identified the car's driver as Leroy Tutt. He was questioned in connection to the shooting but was not charged. In the nearly 5-minute long dashcam video he can be seen getting out of the car and being handcuffed following the shooting. Tutt was jailed in June, 2011 for failure to appear in court on a revoked license. The video first shows Officer Worley and Officer Days pulling Tutt and Reid over. Days walks up to the passenger side of the vehicle, where Reid is sitting, and informs the two men they were pulled over because Tutt ran through a stop sign on South Pine Street. Days then asks to see a driver's license. Suddenly Days pulls out his weapon, points it at Reid and repeatedly screams, "show me your hands" and "don't move." Dashcam video released by Bridgetown Police reveals the moments right before Jerame Reid was shot and killed during a traffic stop. Officer Worley runs toward the driver's side of the vehicle with his own weapon raised. Tutt can be seen raising his hands out of the vehicle. It's unclear from the video however whether Reid is raising his hands as well. "Get him out the car Rog," Days tells his partner. "We've got a gun in his glove compartment." Days once again tells Reid not to move, opens the door and takes a silver object, which appears to be a gun, out of the car. Days then again repeatedly tells Reid not to move and to show him his hands. "I'm gonna shoot ya!" Days screams. "You're gonna be f****** dead! I'm telling you! if you reach for something you're gonna be f****** dead! I'm telling you! I'm telling you! Keep your f****** hands right there! Eh, eh, Jerome, if you reach for something you're gonna be f****** dead! He's reaching! He's reaching! Show me your f****** hands! Reid responds to Days though it's unclear from the video what exactly he's saying. 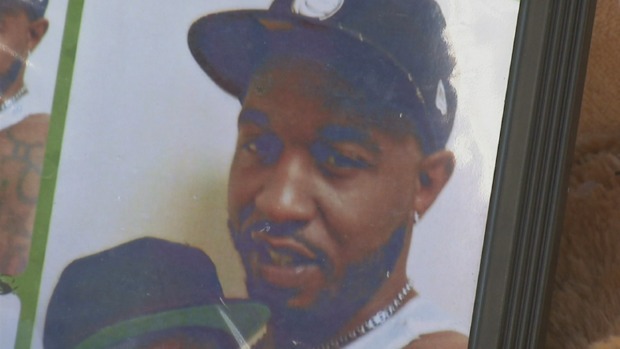 It's been one week since a Millville man was shot and killed by police dying a car stop and it's still unclear why. NBC10's Cydney Long reports amongst concerned residents, friends and family holding a candlelight vigil and march for justice. "No you're not!" Days responds. "No you're not! No you're not! Don't f****** move!" Days then backs away with his gun still raised. Reid then gets out of the car and appears to have at least one of his hands raised. He takes a step toward Days who then opens fire. Worley opens fire as well. In the video at least six shots are heard. After Reid drops to the ground, the officers tell Tutt to get out of the car and drop to the ground, which Tutt does. Several people are then heard shouting in the background as police handcuff Tutt. Webb-McRae said a handgun "was revealed and later recovered" from the Jaguar. Her office did not return a call or email seeking more details on the shooting. The officers have since been placed on paid leave, said Bridgeton Police Chief Mark Ott. The Bridgeton Police department said Wednesday that it routinely doesn't release dashcam video like this but in this case did because they were legally compelled to due to public records standards. The release of the video drew strong reactions from both police and the community. A high ranking South Jersey officer who did not want to be identified told NBC10 he believed Reid appeared to be defiant and belligerent in the video. The officer also said he heard fear in Days' voice as he repeatedly told Reid to hold up his hands. Walter Hudson, a local activist, had a different view however. "Jerame Reid complied to the officers demands to get out of the car and he received a hail of bullets," Hudson said. Before the dashcam video surfaced, witnesses had told NBC10 the scene was chaotic moments after the shooting. "They were telling him, 'Get out the car,'" said one witness. "They (police) was like 'Stop!' and they started shooting." Tahli Dawkins, who was taking out his recycling at the time of the shooting, also told NBC10 he witnessed the incident. "He had nothing in his hands," Dawkins said. "He had his hands up trying to get out of the car, one on the door was getting out like this and he just started shooting him." Reid's friend Shiquera Sierra also told NBC10 Officer Days already had a reputation in the community before the shooting. "Everybody around here in this community can tell you Braheme Days, one of the cops that shot him, has harassed people and has kicked in people's doors," she said. "We have a video of him macing a man when he was in cuffs." All complaints against Days were thrown out in court however. Reid's widow, Lawanda Reid, hired a law firm in hopes of finding out exactly what transpired the night of her husband's death. "We just want answers why this happened," she said. "No one deserves to die like that." Lawanda Reid called for an independent investigation and said she planned her own autopsy of her husband's body. Hudson told NBC10 Lawanda Reid has been unable to speak on the new video showing her husband's death. "She's very distraught," he said. "She's seen the media play out her husband's death over and over again." Jerame Reid had a 3-month-old son, according to his cousin Keesha Springs. He was also incarcerated last summer for possession of heroin, cocaine, contempt of court and resisting arrest. Days was one of the officers who arrested Reid on the drug charges, according to the South Jersey Times. The South Jersey Times also reports Reid spent 13 years in state prison for shooting at three New Jersey State Police troopers when he was a teenager. Springs told NBC10 he was trying to turn his life around. "He was a good kid," Springs said. "He had a troubled past but after that he became a good person. I love my cousin. Everybody has their bad times and he had his bad times. But he was very lovable."